Asthma is a lung condition that can be a mixed bag. It can be chronic and fairly-well controlled, or it can produce serious, life-threatening attacks that result in over two million visits to emergency rooms each year across the country. Asthma involves the narrowing of your airways caused by irritation, inflammation, and overreaction to triggers. Unlike other lung conditions such as COPD or emphysema in which breathing is constantly compromised, asthma flare-ups come and go. In fact, people with asthma can go for long periods of time in between episodes. The symptoms of asthma include shortness of breath, coughing, wheezing, and chest tightness. Most people who suffer from asthma will tell you that they have specific triggers that set off their symptoms. Some common triggers include smoke, exercise, allergens, colds and flu, and irritants such as strong smells and cleaning products. Changes in the weather, humidity, or barometric pressure, as well as strong emotions can also be triggers for an asthma attack. 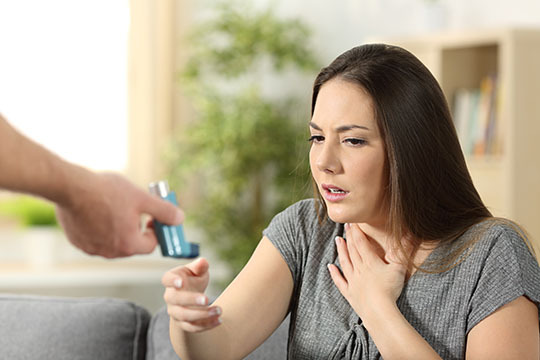 Because the nature of asthma is to swing between flare ups and periods of remission, treating this condition in Western medicine involves a combination of long-term control and medications that can quickly deal with an asthma attack. Long-term treatment includes medication to reduce inflammation of your airways and to prevent symptoms and reduce flare ups. Short-term medications usually involve a rescue inhaler which quickly open up your airways to treat or prevent an asthma attack. In Chinese medicine, if you suffer from asthma, you are considered to have a condition called enduring phlegm. This is because there is always some degree of phlegm obstructing your lungs, even if you’re not experiencing an attack. Asthma attacks are a combination of irritation and swelling of the airways as well as mucous obstructing your ability to breathe. While phlegm is ever-present in asthma sufferers, its presence may not always be felt. In Chinese medicine phlegm is a pathogen that can be broken down into visible and invisible. Visible phlegm is just that; what you see when you cough or blow your nose. However, invisible phlegm can be present but not always visible. It can cause nausea, confusion, and lumps under your skin. In the case of asthma, even when you’re not experiencing symptoms, invisible phlegm is still present. While phlegm is always a part of an asthma diagnosis in Chinese medicine, you may also have a lung weakness that is contributing to your symptoms. This weakness is called a lung Qi depletion and beyond asthma, symptoms may include shortness of breath, a weak voice, feeling cold, a weak cough, and easy sweating. Because your lungs play a large role in immune function in Chinese medicine, a further complication of lung Qi depletion might include low resistance to colds and flu—common asthma triggers for some people. If you seek out the help of a practitioner of Chinese medicine to treat your asthma, their job starts by determining the underlying cause of your condition—why you have phlegm, the nature of your triggers, and the source of any depletion you may have. They would then go to work, using acupuncture, herbs, food therapy, and lifestyle modifications to treat your asthma from the inside out. Their goal would be to decrease phlegm, strengthen your lungs, improve immunity, and reduce your symptoms—including the frequency and severity of asthma attacks. -Breathing exercises. This can be as simple as taking a deep breath, holding for a five count, and slowly releasing—done in sets of six, several times a day. A yoga class or meditative breathing also works to strengthen your lungs. -Pay attention to the weather. Cover your mouth and nose when it’s really cold out, and think about getting a humidifier when your heat is on or if you live where it’s really dry. -Eat to decrease inflammation. Researchers have found that a diet high in Vitamin C containing fruits and vegetables can help with asthma symptoms. Also, eating fish and other plant-based foods are helpful for this condition. Foods to avoid include rich fatty foods, sweets, and lots of dairy. They increase inflammation and can cause a buildup of phlegm. -Go for some caffeine. Research indicates that black coffee can be almost as effective as medications when it comes to dealing with asthma. If exercise is a trigger for your asthma, try having a cup of coffee or black tea about 45 minutes before your workout. -Heartburn control. Understand that there’s a connection between heartburn and asthma, so controlling your heartburn symptoms may also help in controlling your asthma. This means not going to bed on a full stomach, propping up the head of your bed when you sleep, and avoiding those foods that cause you heartburn. Some common offenders include onions, orange juice, tomatoes, strawberries, alcohol, and highly spiced foods. -Be proactive. Recognize the patterns and triggers that set off your asthma attacks. Avoid them if at all possible; if not, understand that an asthma attack can be serious, and travel with a rescue inhaler. If you seek natural remedies for asthma, consult a practitioner of Chinese medicine. Their job starts by determining the underlying cause of your condition, then go to work using acupuncture, herbs, food therapy, and lifestyle modifications to treat your asthma from the inside out. Previous post: Want To Know The Secret To Healthy Aging? These 9 Simple Steps Will Show You How!